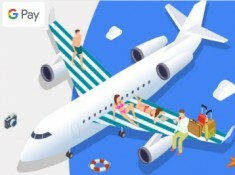 Book domestic flights and hotels on Yatra and pay with PayPal. 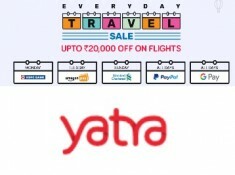 This instant discount offer is valid for first transaction on Yatra with PayPal using PAY19. Eligibility for Discount : Offer is valid once per user during the offer period, the customer who have used code PAY19 will not be eligible for the offer. Eligibility for cashback voucher: Offer is valid only for new PayPal user’s first ever transaction using PayPal and can be availed once per user. If you have made a transaction using PayPal with any other merchants previously, you will not be eligible for this offer. The cashback voucher will be credited to customer's PayPal account 5 days after successful completion of transaction. To avail the offer, customers must opt for “PayPal” payment method on payment page and complete the payment. This code will be used only once per user, the customers who have used this code before will not be eligible for the offer. The cashback voucher earned through this offer has a validity of 60 days from the booking date and can be used as a discount voucher at any Indian merchant accepting PayPal. For Hotel Offer PayPal cashback voucher will be given on bookings above Rs. 2,000.